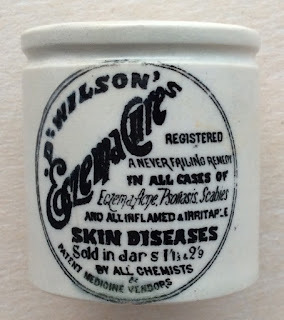 Although the pot states that it is produced by a Dr Wilson, no town name is mentioned so it has been difficult to establish where this ointment for Eczema & Skin Diseases originates from. Two prices are listed on the pot but only one size is known. book produced by Messrs. Houghton & Priestley, page 138.